I've been watching American Idol off and on since it first aired (the off times usually due to my attempts to save money by dropping my cable). I even got my husband into it by watching the season 5 finale (with Taylor and Katharine) in the hotel during our honeymoon! Since we have quite a few friends who watch Idol too we thought it would be fun to have dinner at someone's house every week and watch it together. We watch on the last day of singing - right now that's Wednesday but soon it will switch to Tuesday. We rotate houses each week and the host provides the main part of the meal and the guests each bring a topping or side dish. For example, when we had pizza the host provided the crust and sauce and everyone else brought their favorite pizza topping. There were eight teams so we each got to pick 3 American Idol contestants. 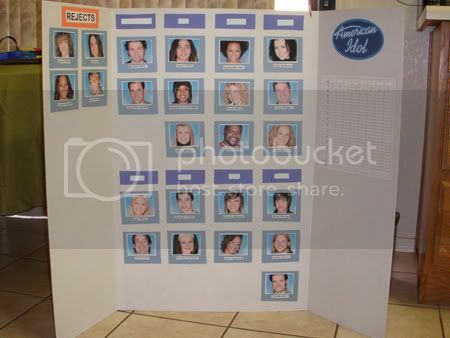 I attached the contestants' pictures with spray adhesive so I could peel them off and put them in the reject column when they got kicked off. My team is Danny, Robbie, and Luke (at the lower right hand corner). I was the last person to pick so I didn't get any of my top choices and I got stuck with Luke since no one else wanted him. Happily, he somehow managed to survive the first cut so maybe he'll do better this week! A fantasy draft will be held after the final 24 contestants have been announced. Each person participating will draw a number which will determine the draft order. To make it as fair as possible it will be a snake or serpentine draft. This means the draft order will go like this: Round 1 - 1,2,3,4. Round 2 - 4,3,2,1. Round 3 - 1,2,3,4 etc. Each person will get to draft one AI contestant per round, and no contestant may be used more than once. Once all the contestants have been drafted, the moderator will arrange a chart so that the contestants' progress can be tracked over the course of the season. No trading is allowed. The winner of this competition will be the person who drafted this year's American Idol. Top 24-Top 16 weeks: Guess the 2 men and 2 women who will be kicked off each week. Two points for each correct guess, for a possible total of 8 points each week. Top 12*-Top 6 weeks: Guess the contestants who will be in the bottom 3 and of those three, which one will be kicked off. One point for each correct guess for the bottom 3, two points for correctly guessing who gets kicked off. For a possible total of 5 points each week. Top 5-Top 4 weeks: Guess the contestants who will be in the bottom 2 and of those two, which one will be kicked off. One point for each correct guess for the bottom 2, two points for correctly guessing who gets kicked off. For a possible total of 4 points each week. Top 3-Finale weeks: Guess which contestant will be kicked off. Two points for a correct guess, for a possible total of 2 points each week. *After the final 12 contestants have been announced each participant will be asked to guess who they think will be the American Idol winner. If that guess is correct, they will be awarded 5 additional points. Note: This schedule is based on the way eliminations have been handled on the show in previous years. If they decide to change something this year, I guess we'll wing it!